How often do you pray for your husband? Hourly, daily, weekly, monthly? Less than that maybe? Prayer time can so often become a rut for all of us, I think. We get focused on the few same prayer requests or things going on in our own lives, that we forget to pray about other things. 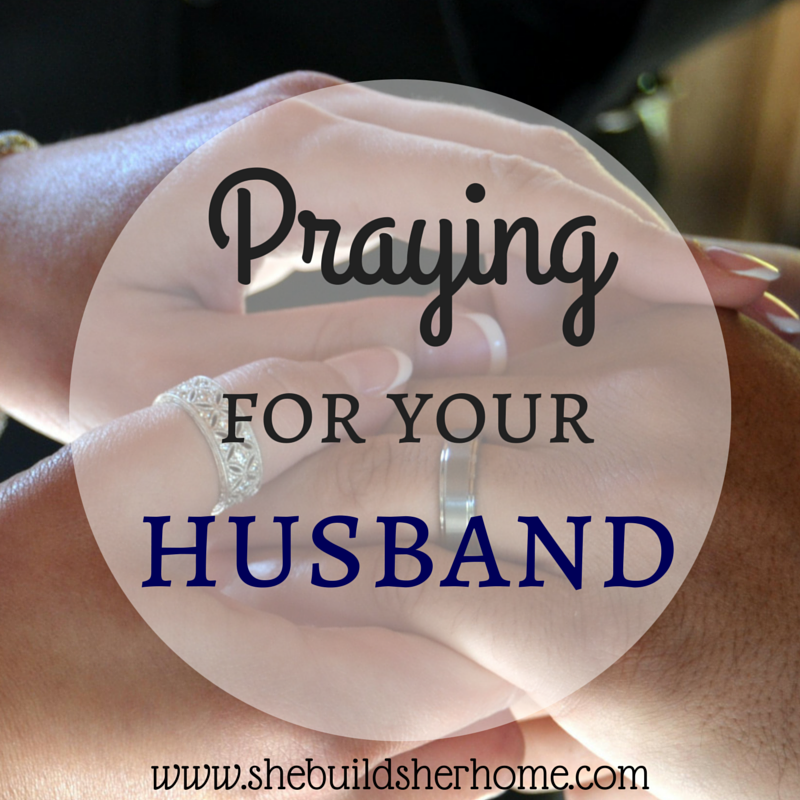 Is your husband one of those "other things" who is falling by the wayside in your prayer life? Don't let him be! As wives, we have a great honor to be able to know our husband intimately. We know his deepest struggles, his greatest fears, his work woes, and what brings him the most joy. We (hopefully) know him better than any other person on this earth. Are we using that beneficially when we pray for him? We need to be covering them in prayer, wives. They face battles every day. At work, at home, at church...everywhere they go. They face battles of lust, of pride, of being the provider, and maybe even deep spiritual battles they are walking through. Who better to take them to the Lord than YOU? Their partner, their love, their confidant, their wife. I am not just talking about praying for his day (although that is certainly good, as well). I am talking about really digging in and praying for him. Praying for every aspect of his life. Praying for hard things he may be going through that you don't even know about. Praying for his walk with the Lord. That he would be the best spiritual leader for your family that he can be. Praying for his decision making--that he would make wise, loving, and biblical decisions. These guys make tons of decisions every day-probably way more than we even know about! Praying for his physical health. For his emotional health. His spiritual health. That he would find favor in his job. That he would balance work, home and other commitments well. There is so much to be praying for. Lets make sure we are taking the time to bless him in this way. Even if he never knows that you are praying for him, be his biggest cheerleader. Be the one who is constantly taking him to the Lord. Let's commit to being our husbands' biggest prayer warriors this year! Who is with me? !